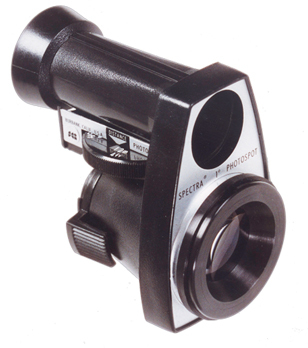 The Spectra Professional IV-A-SP is a unique optical exposure meter system. Simply attaching the Spectra Professional IV-A Advanced Digital Exposure Meter (ADEM) to its Spectra® One Degree Photospot converts your Spectra Professional IV-A into a high-sensitivity, one-degree Spotmeter for narrow-angle reflected-light measurements. Spectra Professional IV-A-SP Exposure Meter PhotoSpot System model # 18007-ASP is an Advanced Digital Exposure Meter for motion picture video and digital photography applications. Without the Photospot attached, the Spectra Professional IV-A-SP measures incident light intensity directly in f/stops, footcandles and lux. And in spot-metering mode with the Photospot attached (through the lens viewfinder, bright erect 1� PhotoSpot ) f/stops and footlamberts can be measured. Plus, you can instantly calculate f/stop difference, contrast ratio, and the average of your particular lighting situation. This last feature is a Spectra exclusive. 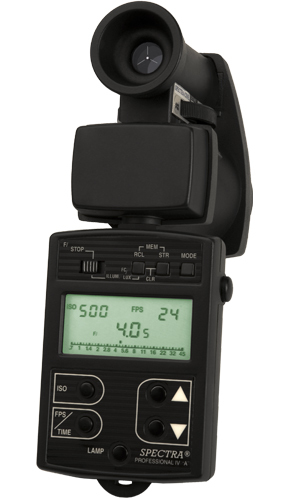 The Spectra Professional IV-A-SP has a digital f/stop measuring range that extends from f/0.35 to f/128 in 1/10-stop increments and an Analog Bargraph range from f/0.7 to f/45 in 1/3-stop increments, in both incident and reflected (one-degree spot) modes. Readings are displayed simultaneously on a backlit liquid crystal display, along with film-speed, frames per second for cine use, and exposure time for digital photography. The Spectra Professional IV-A-SP is designed to measure highly accurate light intensity and covers illuminance levels from 0.1 to 70,000 footcandles and 1 to 100,000 lux. And in the reflected spot metering mode, measurement levels are from 0.1 to 70,000 footlamberts. -- that is a sensitivity dynamic range of almost one million to one! Measures f/stop from f/0.35 to f/128, photographic illuminance from near total darkness- 0.1 footcandles to full 70,000 fc and 1 to 100,000 lux. And in spot metering mode, from 0.1 to 70,000 footlamberts. The ratio of two readings from l:l to 999:1 can be instantly calculated and displayed thereby simplifying the set up of any lighting situation. And in f/stop mode the difference in f/stop between a new reading and the last memorized measurement is displayed in precise 1/10 –stop increments. The average of two readings and/or continuous averaging in f/stop and footcandle /lux or f/stop and footlamberts are made possible. 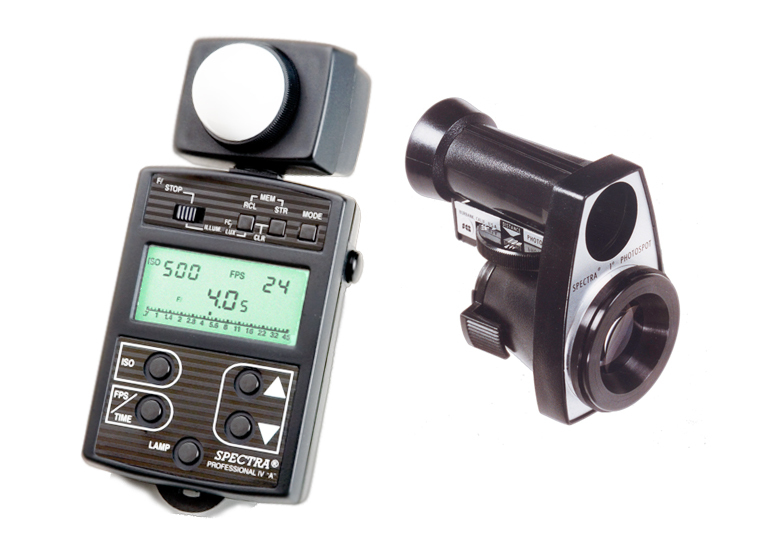 TYPE: Spectra Professional IV-A-SP Advanced Digital Exposure Meter for measuring both incident, reflected and 1 degree spot measurement. MEASURING CAPABILITY: Direct readout of photographic exposures. Measures contrast ratios and average in f-stop., Features both illuminance and luminance modes: illuminance level in f/stop, footcandles (fc) and lux (lx), and luminance in f/stop and footlamberts. MEASURING RANGE: One million to one (20 f/stop) -- widest sensitivity range available! CONTRAST RATIO: Calculates ratio of two readings-- key plus fill to fill light alone, from 1:1 to 999:1. F/stop Difference: The difference in f/stop between a new reading and the last stored/memorized measurement is display in precise 1/10-stop increments up to plus or minus 12 f/stop. AVERAGING: Average of two readings and/or continuous averaging in f/stop, footcandle and Spot metering modes are made possible. RESOLUTION: Digital 0.1-stop. Analog 0.2-stop. ADDITIONAL FUNCTIONS: Memory Recall switch to recall stored reading in memory (M1), second reading in memory (M2) and/or the ratio average and f/stop difference of the two readings. INSTANT RECALL OF ALL MEASUREMENT AND CALCULATIONS: By pressing the recall (RCL) switch, the first stored/memorized reading (M1), the second stored/memorized reading (M2), contrast ratio or brightness (f/stop) difference average footcandle/lux or average f/stop, can be recalled. IMMEDIATE UPDATE OF ALL EXPOSURE CALCUATIONS: If the film speed (ISO), frames per second/Cine (FPS) or exposure time/Still (TIME) settings are changed, the f/stops are immediately recalculated and displayed in normal, f/stop difference, or average modes. MEMORY ERASURE: You can erase the stored/memorized readings in memory (M1) and memory (M2) by pressing the store (STR) and recall (RCL) switch simultaneously. POWER CONSUMPTION: Operation 5mA/reading. Data Retention 5μA. POWER SOURCE: One 6 volt battery; No.’s A544, PX28l, PX28. BATTERY LIFE: Approximately six months normal use. SPOTMETER SUPPLIED WITH: Spectra Professional IV-A meter with Photosphere (for ambient light), Photodisc (for key or directional light), 1 degree PhotoSpot for (spotmeter readings), Leather carrying case and Hard carrying case, Neck-strap, 6-volt battery, Instructional manual and warranty card. Two-year limited warranty included.